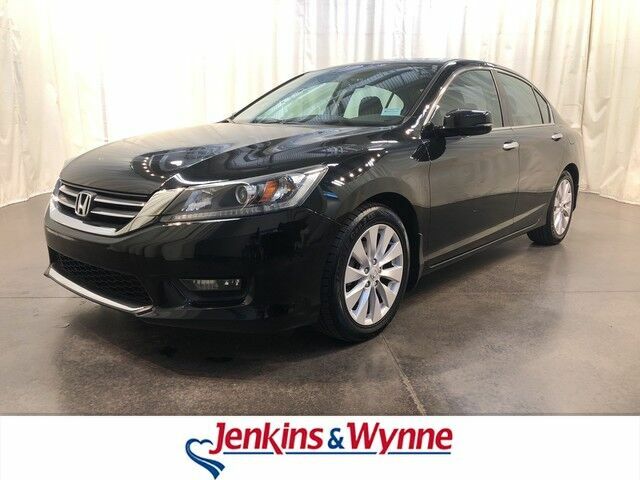 Jenkins & Wynne is honored to present a wonderful example of pure vehicle design... this 2014 Honda Accord Sedan EX only has 122,945mi on it and could potentially be the vehicle of your dreams! This 2014 Honda Accord Sedan has great acceleration and wonderful styling without sacrificing exceptional fuel economy. This is the one. Just what you've been looking for. Driven by many, but adored by more, the Honda Accord Sedan EX is a perfect addition to any home. More information about the 2014 Honda Accord Sedan: The Honda Accord is a mid-sized car, competing against some of the best-selling vehicles in America. Prime targets for the Accord include the Camry and the Altima. The Accord is a solid value, but with a capable and sophisticated chassis that can feel quite luxurious when properly optioned. This versatility allows it to be either a spacious alternative to many economy cars or a less expensive alternative to many luxury cars. There is even a stylish coupe available with performance that matches many sports cars. Strengths of this model include long history of reliability, Fuel efficiency, variety of configurations available, and interior space Although every reasonable effort has been made to ensure the accuracy of the information contained on this window sticker, absolute accuracy cannot be guaranteed. Vehicle information is based off standard equipment and may vary from vehicle to vehicle. The prices are subject to change. Price does not include applicable tax, title, license, and doc fee. This 2014 Honda Accord EX is a 4 door 2.4L front wheel drive sedan! This beauty has black cloth interior, back up camera, CD player, hands free talk, push button start, moon roof and MORE!